Ladies and gentlemen, you all love shopping right? You earn to own, yes that’s the phrase. Life’s good when you have the spending power. It’s called “window shopping”, ladies and gentlemen. They may be nice, but I always resist the temptation to spend that cash. Just by looking from the display section. Hmm… you know what… Sometimes you can afford it, but the thought of burning that big hole in your wallet makes you think twice… right? But wait, Xpax by Celcom is giving you a chance to go shopping for free without draining your wallet – just by joining Talk-a-Thon and talk on the phone. It sounds too good to be true, but it’s that simple. By making more calls, you stand a chance to win RM5,000 worth of shopping vouchers. There are 5 daily winners chosen every day from 15 August 2011 until 30 November 2011. For new Xpax, U.O.X., S.O.X users, just make at least 3 calls in a day to quality. Meanwhile, existing users should make additional 3 calls per day above your July 2011 daily average. This contest also applies to Celcom Broadband and Instanet users too. For Broadband, just purchase additional data, send 20 SMS or upgrade the package to qualify. For Instanet, just subscribe to either Instanet Daily, Weekly or Monthly. Winners will need to answer correctly 2 simple questions to be accounced as winners and can select their desired merchant. If you made it, you’re on your way to a potential shopping spree with merchants like Parkon, Guardian, IKEA, Forever 21, Top Shop and more. So shopaholics, what are you waiting for? Win those awesome shopping vouchers with Talk-a-Thon and you get to shop, shop and shop. For more information, check out the Xpax Talk-a-Thon website. 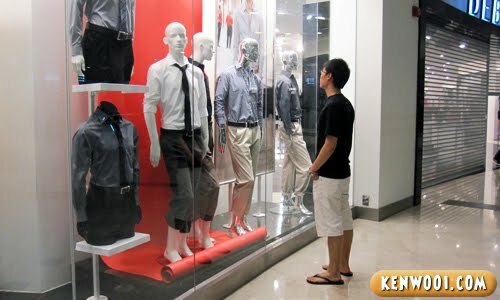 P/S: This is a commercial break, stay tuned for the usual kenwooi.com entries! Thank goodness for the glass or else sure you’ll flip up the skirt, you hamsup you!!! LOL!!! Seems like those in East Malaysia kinda ‘rugi’; only 2 outlets to shop?! hahaha ! The last picture Y U NO LOOK AT THE BIGGER ONES ? the shops seem to be closed that time already.